The upper world, light sophisticated energy. The stars, divine creatures, and gods. This world, light and heavy energy, here and now, Mother Earth. People’s lives. Heavier energy, but not Hell, may be lucky, beautiful things. Death. Represents the Inkan capital Cusco, the center for the Inka Empire or the people who lived in the middle of the 3 lives, in the 4 elements and the middle of the universe. the 4 big stars in the South Cross. The 12 festivals / The Inkan calendar. The Inkas had a calendar, composed by twelve months, each of 30 days. Each month in the Inka calendar had its own festival (meaning month). The twelve outer corners mark the twelve corners of the year and an achievement of awareness. This is only a simple interpretation – I am sure there are others. 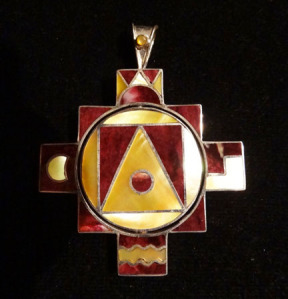 Andean Cross – Chakana – It is inspired by the Constellation of the Southern Cross, which orients all creation on the Southern Hemisphere, as it is above and shall be below. On a small scale, it is the symbol of the Pachamama or Mother Earth, and on a larger scale, it is the symbol of the Universe. The four arms represent the four cardinal points (north, south, east and west). The circle represents eternity. The square represents the four natural elements (air, water, earth, fire). The triangle represents the three worlds in harmony: Hanan Pacha – spiritual world; Kay Pacha – physical world; and Uju Pacha – mental or psychological world. The small circle in the center of the triangle represents the point of harmony or equilibrium. All these elements together mean that to feel happiness in all senses human beings need to harmonize their three worlds or bodies using the four natural elements, with wisdom. Thus we will reach eternity, guided by the Southern Cross or Square Cross. She is also an ever-present and independent deity who has her own self-sufficient and creative power to sustain life on this earth. Pachamama is usually translated as Mother Earth, but a more literal translation would be "World Mother" (in Aymara and Quechua. 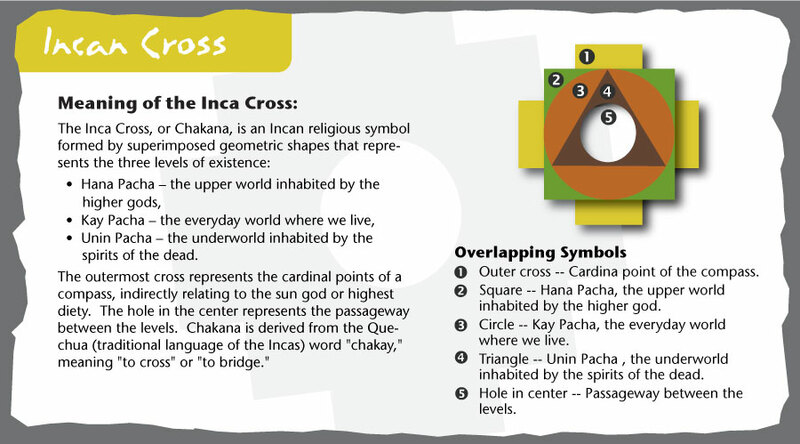 The Chakana, or Inca Cross, is a symbol revered by the ancient cultures of Peru, namely the Inca. They considered it to be the most complete sacred geometrical design. This symbol is often seen at ancient sites and sacred centers though out the Andes of Peru and Bolivia.Traditonally, it (cruz cuadrada meaning square cross in Spanish) represents the Southern Cross constellation which the ancient Andeans believed to be the center of the Universe and was easily distinguished while gazing upon the night sky. Ukju Pacha - Representing the Lower World/Inner Realms/Other World. Interestingly, these three worlds seem to correspond with the Holy Trinity; the Father, Son and Holy Spirit seen in Christianity, as well as the Body/Mind/Soul (Spirit) idea seen in Eastern Religions. There are symbols honoring spirit animals in many of the ancient sites and structures in the Andes. In fact, the city of Cusco, Peru was built in the shape of a Puma. 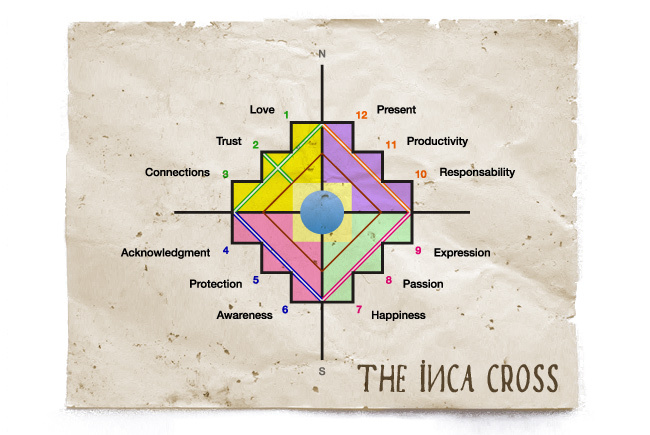 In addition to the Three Worlds, there are twelve steps that surround the Chakana. Each of the twelve steps is said to represent a level of initiation and an attainment of consciousness. North, South, East & West, as well as the four elements, Earth, Air, Water & Fire. 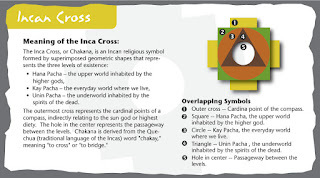 The top of the cross is said to represent God, or Viracocha, with the highest level of consciousness being expressed as the Great Spiritual Central Sun. 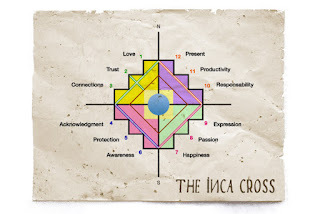 Mother Earth, Pachamama, anchors the bottom of the cross bringing vertical alignment to the equal armed cross, which ultimately leads society to the raising of the Sacred Cross. Even today, the people of Peru and Bolivia honor the Southern Cross or Chakana each year on the 3rd of May. May is the month of harvest and during this celebration people give thanks to the cross for the protection of the their crops. The Chakana, when used in meditation or in teaching, is said to bring spiritual balance and deeper insight into the many levels of consciousness. Hierographics, the Square symbolized manifestation or realization. The Square is known as a symbol of morality. While the Circle often represents the spiritual world, the Square represents the material or physical world. It said also to symbolize the male energy. The Circle is an ancient a symbol of unity, wholeness and completion. With no ending or beginning, it is the perfect symbol of the Infinite. In many pagan religions, the Circle is seen to represent the feminine force, Mother Earth or the cosmos. In Astrology, the Circle is associated with the eternal, spirit and the life force. The Celts viewed circles as having both protective and celestial significance. The word Circle originated from the Latin word “circus”. A circus is where shows or activity take place in a circle. 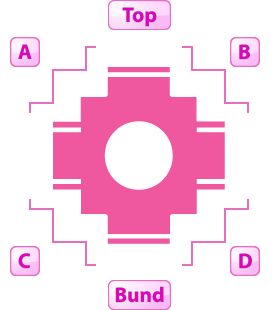 The Circle is a symbol of Mobility when in the form of a wheel. One of the primary and most fundamental geometric symbols, the Triangle often represents the sacred Trinity in many religions. When pointed upward, the Triangle is said to symbolize the sun, fire, ascent to heaven, power, prosperity, royalty and the male energy. When it is pointing downward, it symbolizes the moon, water, passivity, the great mother and grace. When the two triangles meet at their points, it is said to represent the sexual union between man and woman.